New Meal Prep Monday post for you today! 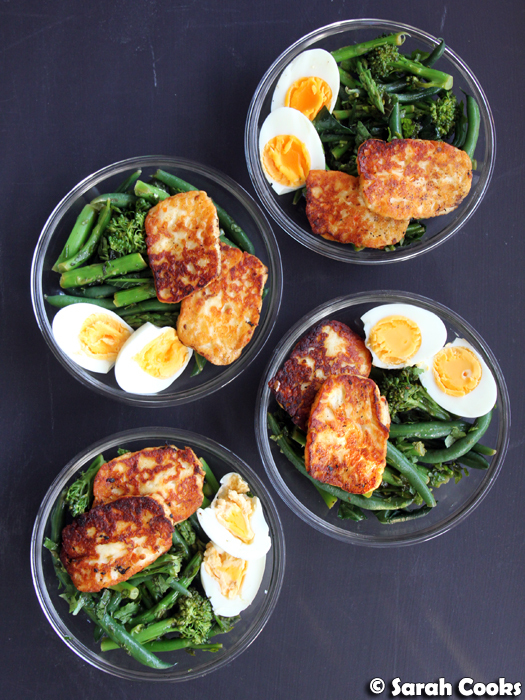 Harissa Halloumi Green Bowls! 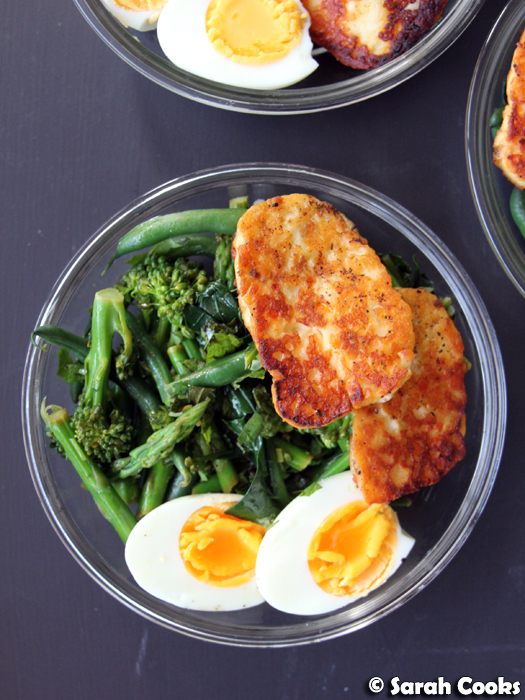 Harissa-marinated slabs of halloumi sit atop a mixture of well-dressed green vegetables and herbs, with a hard-boiled egg for extra protein and general deliciousness. Vibrant and fresh, full of green vegetables and protein, and with loads of flavour. Everything I want in a weekday lunch! I came up with this recipe totally by fluke. One weeknight I was alone at home and needed to make myself (a preferably light and healthy) dinner. Rummaging through the fridge I found lots of green vegetables and herbs (bought optimistically the previous weekend but slowly softening in the fridge over the week), eggs, halloumi, and half a jar of harissa. That was really all the inspiration I needed! I hardboiled some eggs (you'll see in the above photo that one cracked and ended up a funny shape, but was totally edible). I trimmed and blanched some green beans, asparagus, and broccolini, and while they were still warm I added a mix of fresh herbs, and dressed them in lemon juice and extra virgin olive oil. I sliced a block of halloumi into thin-ish slabs, and marinated them in a mixture of harissa, lemon juice and olive oil, then fried them in a pan until golden brown. I decided to make enough for my dinner plus some leftovers, and as I was assembling all the different components, I realised I'd made enough for exactly four portions, and that it all looked totally meal-preppy. Meal prepping must be totally ingrained into my system now; I even do it subconsciously! I immediately divided the food between my set of glass containers, and whipped out the camera. You'll also note that I put the nicest looking eggs in the foreground - putting my best egg forward, so to speak. These bowls were great! Fresh and healthy, and with nice strong flavours - the smoky chilli, the salty halloumi, and the fresh herbs all went so well together. I had these for a couple of dinners and a couple of lunches, and I was so pleased I often find that strongly flavoured food feels more filling and satisfying than bland food; especially important when you're trying to eat light. I hope you enjoy these green bowls as much as I did! Place the eggs into a small saucepan and cover with cold water. Place over a medium heat and bring to the boil. As soon as it comes to the boil, place a lid on and turn off the heat. Allow to sit for 8 minutes, then drain and rinse under cold water until cool enough to handle. Peel the eggs, cut in half lengthwise and set aside. Top and tail the green beans. Snap the woody ends off the asparagus, and trim the ends off the broccolini. Chop the asparagus and broccolini into thirds. Bring a pot of water to the boil and add a good pinch of salt. Add the beans to the water and boil for 2 minutes. Add the broccolini and boil for a further minute. Add the asparagus and boil for a further minute. Drain the vegetables and rinse under cold water to arrest the cooking. Place the cooked vegetables in a large mixing bowl. Roughly chop the coriander, mint, chives and spring onion, and add to the mixing bowl. Squeeze over the juice of 1/4 lemon plus half the olive oil. Season generously with salt and pepper and toss to combine. Heat a non stick frying pan over a medium heat. 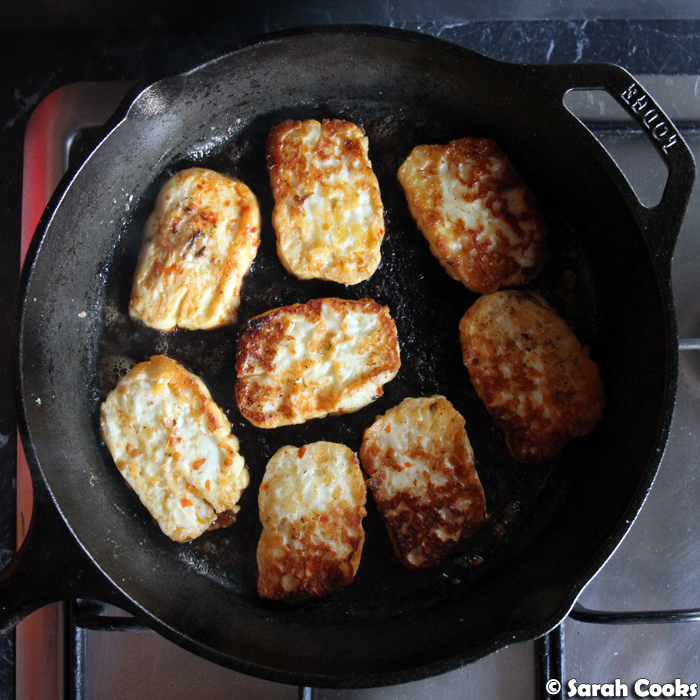 Fry the halloumi slices for a few minutes on each side, or until golden brown. 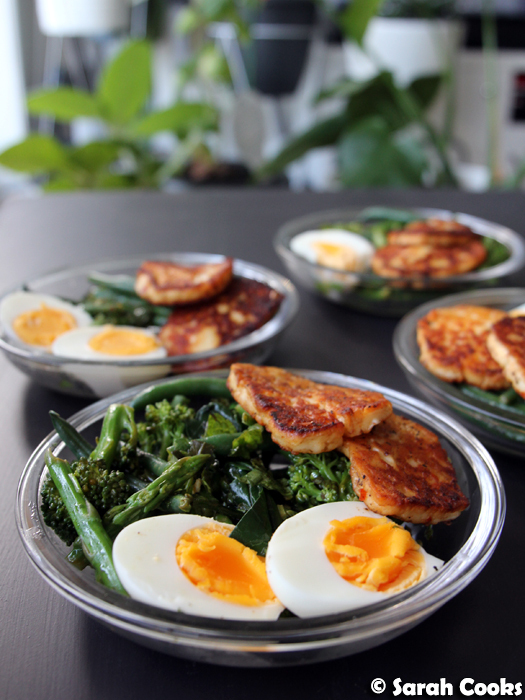 Divide the cooked green vegetables, hardboiled eggs, and halloumi slices between four serving containers. Isn't halloumi the best? And I wish we could buy smaller bunches of herbs. I can never use them up!